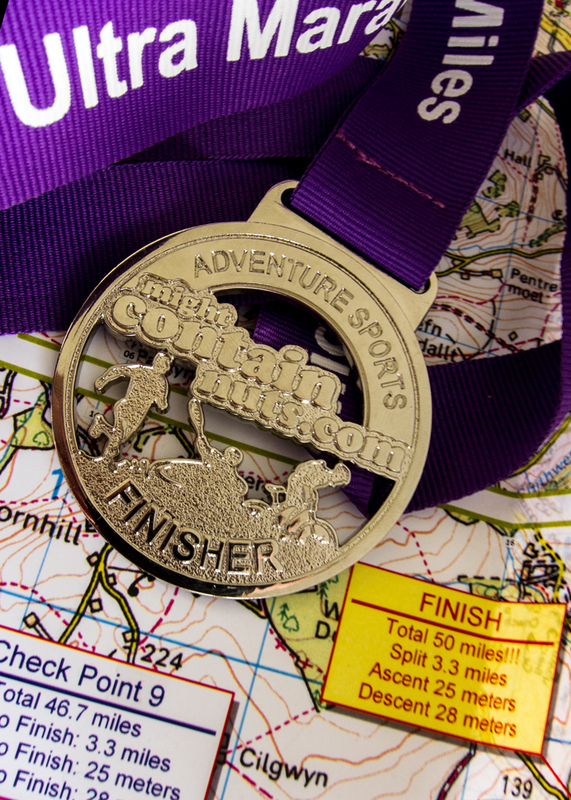 Why run a Mountain Marathon? Where else can you spend a weekend, in tough conditions, camping in a tiny tent that is pitched on a wet slope, in the wind and rain, and end up with a smile like this after 50km of running up and down big hills? Running in to the finish, slightly broken, but very happy. It was the challenge of navigating in the mountains and the camp craft that attracted me to my first Mountain Marathon in 1999. Since then I’ve got fitter but the challenge is still the same. I like the score classes. You don’t receive the map until 2 minutes before setting off. The map is marked up with controls. These are 15cm square flags, with a small electronic “dibber” on them, Each control has a number of points, these points, with your exact time are recorded on a little chip you wear on your wrist. This chip is dibbed into the control box when you find the location. Each team of runners has a set period of time with penalties for not finishing within the time period. It’s a two day event and the pair of you must be self sufficient. The winning team is the one that collects the most points over the two days. In the event of tied points, the fastest team wins. I’m really lucky to have a really solid running mate to share this with – Jeremy. There is a huge amount of tactics involved, and for the winning teams a lot of fitness. I really like running these events with Jeremy. After talking to another team a few years ago, who persuaded us that being minimalist and uncomfortable isn’t necessary. We now do things in comfort, cheese, crackers and whisky make the evening far more enjoyable than being in a cramped tent waiting for the morning. 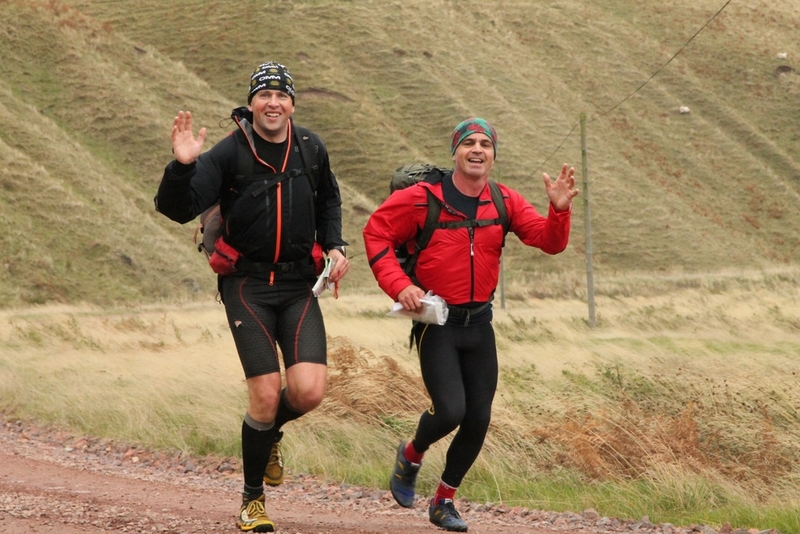 This year neither Jeremy or I were that fired up for running fast across the Cheviots. We set off on Day 1 with the plan to have a nice weekend. We were a little surprised to find out in overnight camp that we were lying seventh, and had made the chasing start of the top 20 teams. We had obviously picked a good course to pick up plenty of points. This meant a 0742 start for Sunday, but with the clocks going back it wasn’t going to be a massive hardship. 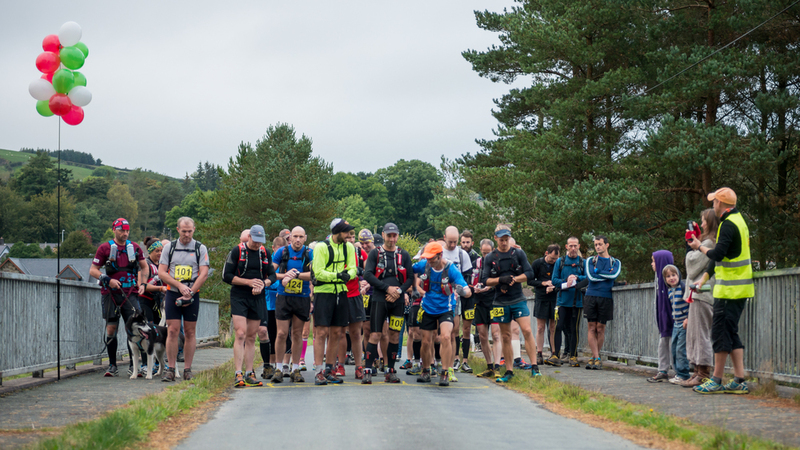 In retrospect we made a strategy error on the Sunday, and should have gone West, onto the moors, instead of East of the start line and into the forest. We were lured by some controls with big points, and totally missed the fact that we could have picked up several smaller scores, worth more, in the same time. Anyway, we ran in, finished 54th on day 2. Combining our points gave us 22nd overall which, given 120 starters, and our less than competitive approach to the weekend is pretty pleasing. For me, the event is all about the chance to go run somewhere that I wouldn’t normally and have the challenge of having to have really good navigation. That I get to do it with my best mate makes it really special. Thanks Jeremy, a cracking weekend, and proof that guts makes glory, not a diddy rucksack! Though to be fair we could cut back in a few areas…I might take one less buff next year! Time for a write up of an event. This one comes in a roundabout way. Mainly because I got to the start line with so many doubts and feeling more pressure than I had before. It’s an ultra right up, so you might want to grab some hydration (tea should work). Sandra and I have run long runs together over the last little while, and her company in long runs whilst training for MdS made some long weeks bearable. 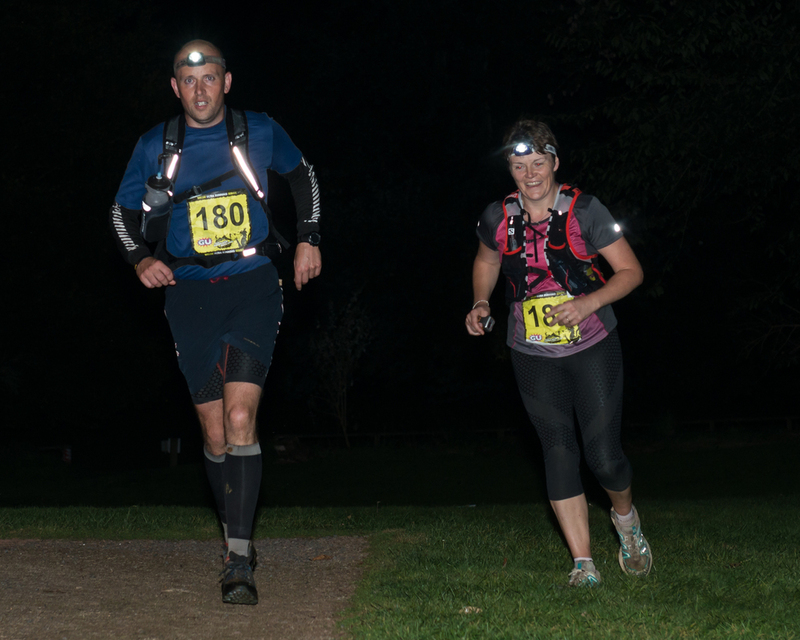 The original aim was for the South Down Way 50 in April, but events meant that Sandra deferred to the Wye One Way Ultra, run by Might Contain Nuts. I can’t really remember when she asked whether I would run it with her, but I said yes, and booked my place. The route is quite special, first it is linear, it starts in Llangurig and roughly follows the Afon Gwy (River Wye) to Glasbury. When I say follow, it sort of meanders up off over hills, meaning that the 50 miles roller coasters up and down 2200m. Why the pressure? Well, I managed to roll my ankle the weekend before the run, and it was a little achey. Plus I felt that I hadn’t really managed to put as many back-to-back miles in as I would have liked. I also really wanted to make Sandra’s run as easy as possible. Running that distance is mainly mental. It is going to hurt. It is about managing everything to get to the finish. The last thing I wanted to be was another thing that Sandra needed to manage to get her to the finish. I found it quite challenging planning in my head. Trying to visualise how I would go at different points. I am fairly detailed in how I plan. And the unknown, being there to be invisible became more and more of an issue as my ankle got more sore. I’m so used to running my own race, this was a new challenge for me. Sandra messaged me to say “Start together, finish together” which worried me. The doubts I had meant that I needed to know, if I was truly broken, she would carry on. We were fortunate that Rhys, Sandra’s husband was going to be following us down the route and be at checkpoints (CP) so I knew I could bale if I really had to. Though I really didn’t want to, I doubted my ankle would take the battering. I got all the food together that I needed. 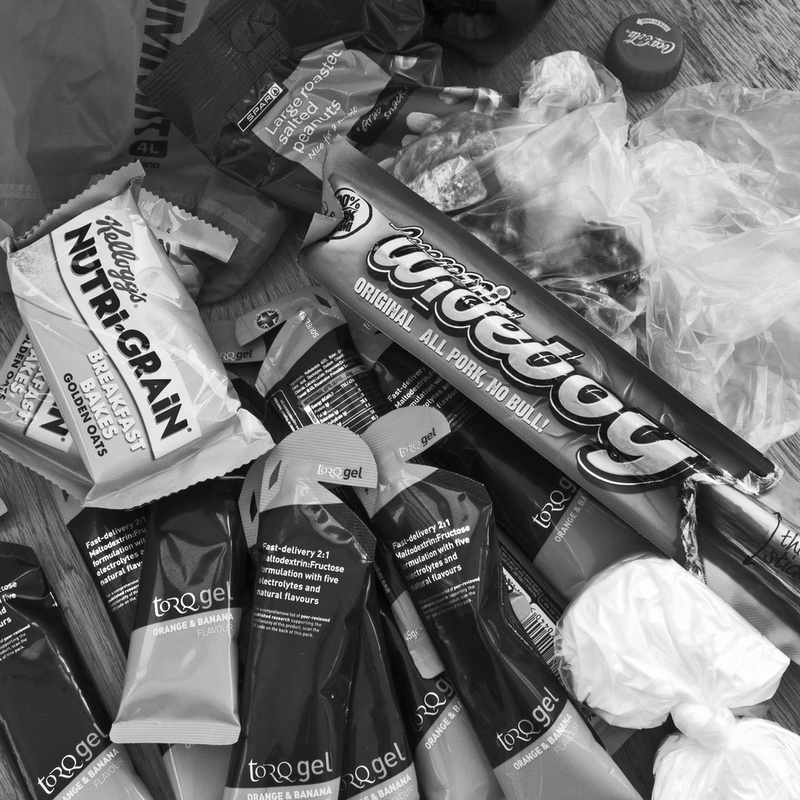 This time I was going to take most of my calories from TORQ gel and TORQ energy, I had two Pepperami Wideboys, some NutriGrain breakfast bars and some ’emergency’ Jelly Babies. Because we had Rhys following us, I also had some flat Coca-Cola, just to lift me at CP’s. Along with the madatory kit my pack was 3.5kg, plus a litre of water, made 4.5kg. I packaged it all down, and was comfortable with the set up. One chest bottle, and one bottle in reserve, just in case it was hot on the longest leg, that also had some large climbs on it. I also decided that I would use tried and tested shoes; the Inov8 Roclite 315, just for a mixture of grip and cushioning. My last job was to get the CP’s onto a Movescount Route, this would mean I would have some leg by leg navigation. Because the route is marked it should be a case of just following the markers, but it’s nice to have a ready reference. We arrived in Llangurig at 7:15, registered in the village car park. Made use of the portaloo’s and controlled start nerves. The bus load of other runners, who were being shuttled up from Glasbury, arrived, The quiet car park became a lively chatter of 40 ish runners. A couple of dogs were running. We all wandered onto the little lane for the race briefing. Because it had been dry the cattle were still on some of the fields we were running through. As always leave gates shut. And other than that it was a case of “have a good one”. We all agreed the start could be brought forward a minute, and then a hoot of a horn and we all started shuffling forward. It was immediately nice to be running. The nerves gone, the focus on the job all that was important. Sandra and I were running together, just finding our way through the runners to our easy pace. With a race this long, the start is never rushed, warming up as you go. The route slowly turned uphill, then off tarmac and onto farmland. Not fighting the hills was key; just enjoy the views. I was aware of Sandra breathing hard, and we both slowed to a walk together. Up a big grassy hill, lovely views to the west towards Pumlumon. The group of runners already spread out, and finding their own pace. Plenty of gates, and that was a theme that carried on. Of course, running down the Wye, if you climb, you descend. That first descent was probably the steepest of the course. It would be lovely on a shorter run, but on this distance taking it steady was essential. We come out on to a little road, and the pace picks up naturally as we are on easy terrain. Quickly, it seemed, we arrive at CP1. We’re quickly through, no need for anything after 5 miles. We join a runner, Nick Lindley, who is having a big year of Ultra’s and we chat about all sorts of stuff. He’s off to do a marathon assault course next weekend. Sandra and I are both impressed! We climb steeply over Cefn Bach, with Nick pulling ahead before a lovely descent. Sandra and I catch Nick at the Afon Elan crossing. Because of the low water, it really is only a splash, but getting wet feet in the first 10 miles isn’t ideal. We join tarmac and as three runners round a very low Craig Goch Reservoir. Just before crossing the dam, Rhys is roadside. Sandra ditches a bit of her kit that she is finding too heavy. CP2 is on the other side of the dam. The marshalls, in their camper, had a lovely smell of sausages wafting out, I joked with them about having no brown sauce. Great to get some friendly banter whilst filling up on water. There are toilets here and we avail ourself. We chat with a runner who is on the way on, who has run the event before. he wans us there aren’t toilets for a long time yet. CP2 to CP3, is on the face of it simple, alongside Penygarreg Resevoir, then down Garreg Ddu Resevoir to the dam and CP3. 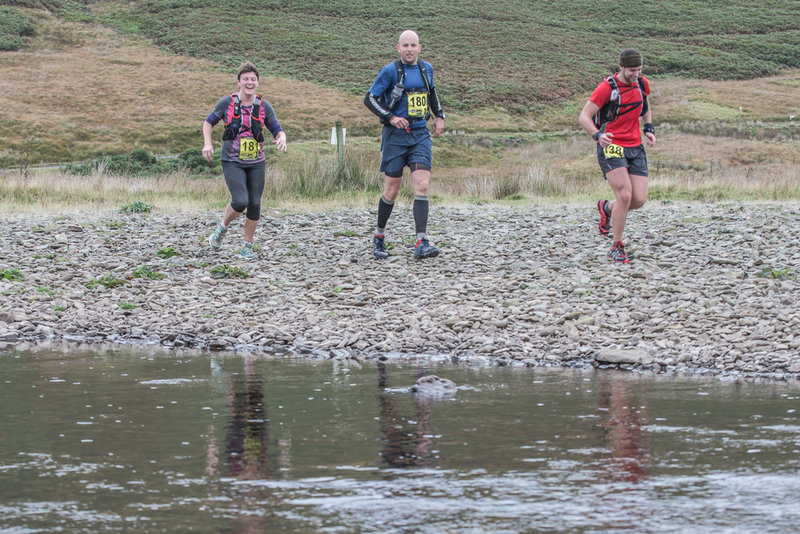 At the end of the Penygarreg Resevoir, we catch the runner in front who was trying to work out which fork to take on an unmarked junction. Quickly checking my watch, I can see it’s right and we run passed. The next bit of reservoir is stunning – inky water, slate blue rock and fresh green grass that has grown on the low level fringes of the foreshore. We pass a big group of walkers who shout “runner” to alert the others. I explain jokily that we’re shufflers. It’s very friendly. 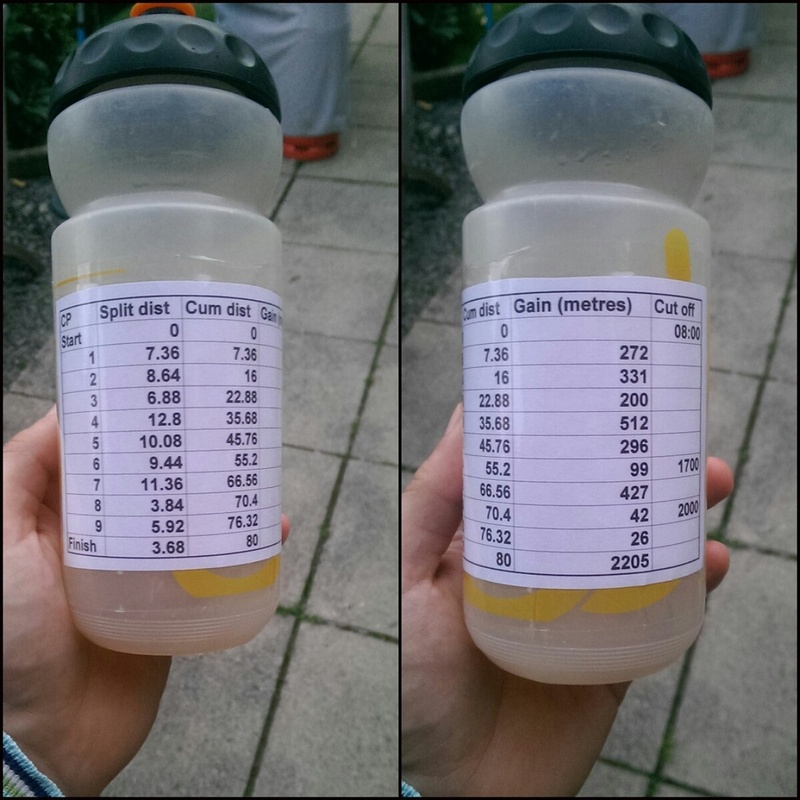 We arrive at CP3, Sandra takes a layer off, we refill water, have a chat to the marshals about how bad Diet Coke is. Rhys points out we’re moving quite quickly. We both agree we should back off a bit; we’re going to need to. We’re both avoiding the fact that this leg is long, and with a big climb. The other runner sets off in front of us and we grind up past the Church. We’re chatting about future events – Snowdon Marathon for Sandra. We’re steadily contouring round above the western end of the Caban Goch dam. We talk work on the descent back to tarmac. Again it would be a lovely quick descent on a different day. We turn from travelling SW to just North of East as we climb back along the other side of Caban Goch. As we climb, we concertina closer and further away from the runner in front, depending on whether we are climbing or descending. On the long pull up Gro hill we pass the walkers again. Whilst they’re still bantering, we’re a little more subdued this time. A couple of mountain bikers zip down, it really is great riding in the Elan valley. We’re descending here when Sandra pulls up with a really sharp pain in her knee. Obviously in a lot of pain, we talk through that it has happened before, and that it’ll pass. This is probably my most negative point of the run. My ankle is sore, and if Sandra needs to finish the desire to stop is massive. Sandra runs it out, and we climb again to Carn Gafallt. Sandra’s knee tweaks again on the descent into Llanwthrwl. But it quickly subsides and we descend to the CP. The runner in front is sat on a chair by the village hall. I take some pain killers that Sandra has brought. I can’t quite feel happy on my ankle. A good shot of Coca Cola too. Sandra has some coffee and we’re off ahead of the runner still sat. The Marathon distance run has started at this CP, and so there is more evidence of runners, suddenly. Grass shows the passage of people. This is reassuring for route finding. The next leg is all alongside the Wye, and is beautiful running. I hadn’t quite plotted the CP in the right place, so I need to “skip” this on the navigation of my watch. Not having done it before, I stop the watch trying to get into a menu. Doh!! I start my watch again. So here is the first section the watch recorded. We pass a mountain biker, who I’m briefly jealous of. I’d like to come back and ride this section. Having paddled it, and now run it, it seems like a good target to have. We pass a very impressive house that I’ve never seen before, I think this is Doldowlod. It’s hard to imagine anyone investing that kind of money in such a development these days. Very impressive. CP 5 itself is a bit of a blur, it’s on the side of a quick back road. 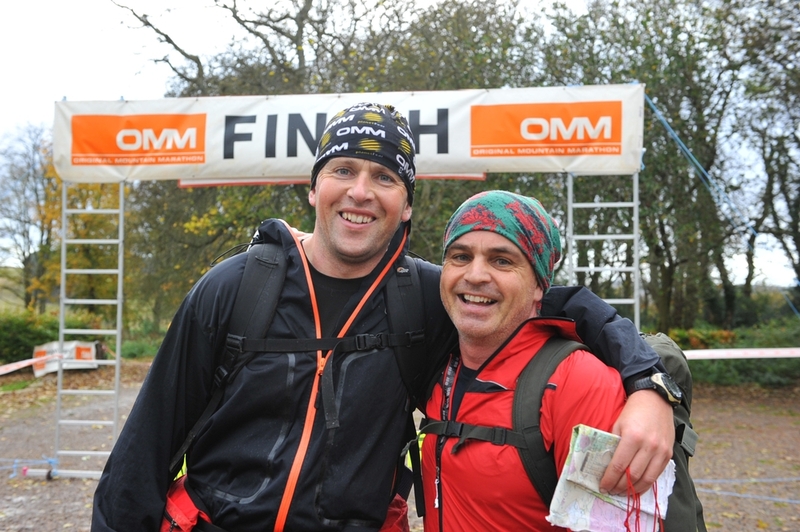 I chat to a marshal who ran at Trail Marathon Wales, and was very pleased to hear that Run. Coed y Brenin has now got such an extensive range of demo trail shoes. I treat myself to a Pepperami and a slug of Cola here. There is a very uncomfortable looking runner, who is cramping badly. I offer him some Pepperami as he’s lacking salt and electrolytes and isn’t carrying any/ It’s 6 miles to CP6 and he is being encouraged to consider his choices carefully. As we run out through woodland, I’m burping Pepperami and Cola, stay classy Ash! Sandra, understandably, wants to stay clear of the smell if she can. She’s feeling a little peaky! We have a quick navigation moment, as we cross into a field we can’t quite see where the path goes, we add a few hundred metres on, going to an opposite corner before we spot a yellow sign and regain the track. This leg runs right alongside the river, some fantastic swimming spots and at low water the lovely rock shelves are visible. We pass a really impressive chalet style building, Dolyrerw Farm. Sandra and I are both smitten! We pass under the railway, and then pass Builth Rocks, there used to be a very popular canoe slalom held here, but not at these levels. We can see the Royal Welsh Showground on the other bank, Builth Wells is close. We run alongside the Rugby pitch, Builth are playing Gwemyfyd and are winning 27-0 (they want on to win 49-0, well done!) and there is a great atmosphere. Sandra is trying to work out what to eat, if anything, as she’s feeling a bit queasy. I make use of the toilets, scarf a Nutrigain, some JellyBabies and some Coke. This next leg is the last big climb, and so we’re preparing ourselves mentally. Out of Builth and we turn uphill, on tarmac, there are lots of midges here and it is a little unpleasant. We climb about 70m and then on the crest of the hill, Sandra spots a little hedge lined lane on the other side of the valley. We both know we’re heading up there. We descend to the small Duhonw river before climbing up what feels like an old drover road. It’s pretty, but hard. We climb to about 400m on the side of Banc y Celyn before contouring. We lose a little height and join a track, before a small climb to CP7. It’s under a half marathon left, in fact the 10 mile trail race starts here. We travel along “Twmpath” which is a beautiful mound of grass, quite high above the Wye. This is easy running, and I was lulled into false sense of security. Just above Erwood we drop in to a little wood. There are lots of brambles, and a nadgery little trail it’s only 500m or so long, but this is the most uncomfortable, technical section of trail yet. We finally clear this, and have about a kilometre to CP8. Sandra is hobbling, and has a very sore heel. We stop, and she gets a plaster on the blister. “Should have listened to Rhys”, she says, as he’d offered that advice earlier. Nothing ever gets better on an ultra! We run into Trericket Mill, this CP is my final water fill up. I gobble a couple more Jelly Babies. We cross the A470 and follow the Wye Valley Walk alongside the river. There is a path, a hard path, I whoop in relief! The terrain is a little easier. Rhys toots his horn as he leaves us to get to CP 9. We tick down this leg pretty quickly. The running is pretty simple, the route finding easy, and the light is still pretty good. Llangoed Hall is impressive and well lit, before we pass the Llyswen Water Treatment works and get back on tarmac. I know we’ll both finish now. CP9 is quick, Rhys has noticed we picked up the pace, and confirms that if we do the same again we’ll finish under 12 hours. The light is fading so we put head torches on and run through woodland and farmland before picking up a firm trail leading towards Glasbury. At the road, we turn left and run to Woodlands OEC, where the finish waits for us. Sandra spots that we’re just inside 12 hours, and whilst we’d been vaguely aware that Sandra was running well, here at the finish line it’s confirmed; she is the first lady home What an achievement – I’m so chuffed to be along for the run with her. The emotions of finishing smash home for Sandra, and a little lip wobble are sorted by a hug from a massively proud Rhys. If you’ve read this far, you’ll recognise the amazing achievement – donate here! I’ve learned a lot, again, about myself. I’m pleased to have made it down the Wye. It’s very satisfying personally, but I’ve got far more pleasure considering Sandra’s achievement. Da iawn San!